The Couture Council of the Museum of F.I.T. 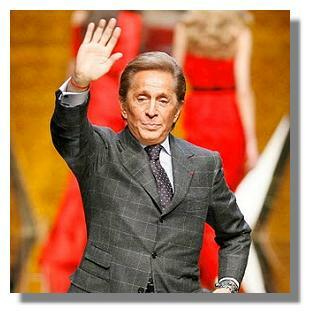 will honor Valentino with their 2011 Couture Council Award for Artistry of Fashion at a benefit luncheon Wednesday September 7, 2011, at the David H. Koch Theater, Lincoln Center, New York City. As has become the tradition, this luncheon heralds the arrival of Fall Fashion Week. 1stdibs.com, the luxury on-line retailer, is a sponsor of the luncheon and a generous supporter of The Museum and its activities. Valentino was chosen to receive The Couture Council Fashion Visionary Award by the Couture Council Advisory Committee, an independent group consisting of curators, editors, and retailers. Members include Pamela Golbin, curator of the Musée de la Mode; Akiko Fukai, director and chief curator of the Kyoto Costume Institute; Caroline Milbank, independent curator and author; Glenda Bailey, editor-in-chief of Harpers Bazaar; Hamish Bowles, European editor-at-large of Vogue; Ken Downing, fashion director of Neiman Marcus; Linda Fargo, senior vice president of Bergdorf Goodman; Nicole Fishcelis, vice president and fashion director at Macy’s; and many distinguished others. Dr. Steele serves as chair. Past recipients of The Couture Council Awards are Karl Lagerfeld in 2010, Dries Van Noten in 2009, Isabel Toledo in 2008, Alber Elbaz in 2007, and Ralph Rucci in 2006. In 2008, Giorgio Armani also received a special award for Global Fashion Leadership. The Couture Council of the Museum of FIT annual Summer Party is Wednesday, August 17, 6:00, at The Boat House in Central Park. Every August members and guests get together before the Fall Fashion Week---it's practically the last party New York fashion designers can go to before finishing their shows (and all the ladies love seeing them). Guest expected include designers Zac Posen, Zang Toi, Maria Cornejo, Mary Jo Diehl, Cathy Hardwick, Eric M. Javitz, Gemma Khang, Patricia Field, Willa Kim,Tiffany Koury, Gilles Mendel Breitman, Thakoon Panichgul, Hervè Pierre Braillard, Steven Stolman, Patricia Underwood, Devon Scott, Yildiz Yuksek Blackstone and many more…. The Couture Council is a membership group of fashion enthusiasts that helps support the exhibitions and programs of The Museum at FIT, a specialized museum of fashion. Your participation in this membership group makes it possible for the Museum to mount world-class exhibitions accompanied by publications and public programming, such as the annual Fashion Symposium. The Couture Council also supports the conservation and documentation of the Museum’s permanent collection, as well as facilitating the acquisition of historically and aesthetically important fashions and accessories. Members of the Couture Council receive exclusive invitations to at least five events a year, including behind-the-scenes tours of the Museum’s collection, exhibition receptions, and visits to the ateliers of fashion designers in New York. In addition, Couture Council members are the first to receive invitations to the annual Couture Council awards ceremony and benefit luncheon. A Couture Council Annual Membership is $1,000 per individual or couple, or $350 for Young Associates (under the age of 35). Membership is tax deductible to the extent provided by law. Please make checks payable to the Educational Foundation for the Fashion Industries. Mail checks to The Museum at FIT, attention: Couture Council, Seventh Avenue at 27th Street, Director's Office, Room E304, New York City 10001-5992.